We know that Scandal doesn't do ripped-from-the-headlines in quite the same way as, say, Law & Order, but could it be that Redwood Johnson is the new Carlos Danger? We're going to go with yes. It seems Shonda Rhimes took a page out of Anthony Weiner's book. There was a lot to like in this episode, not the least of which was Lisa Kudrow telling the president to "tame his cobra." We're very excited to see her setting up shop on this show, and we think she could be just the thing to spice up the non-Operation Remington plotlines. Not that we're bored with the B613 gang of course, but quite the contrary. This ragtag group of Washington's shadiest characters has really got us hooked, and not just because of all the overdramatic old crony encounters. Seriously, this show knows how to make a character enter a room. And now, on to the Ridiculist. "Your father would slit your throat and drink your blood if it served a Republican." Wow, a little harsh, Jake? We know Mr. Pope's a bad seed, but man, go easy on Olivia a little. Harrison's 'they said yes' dance was exactly why we love him. We want more Harrison! Desiree Oaks? They really couldn't think of anything less obvious for the name of a senatorial mistress? We reallyyy don't want to like Fitz, but then he goes to arrange a funeral service and comforts a grieving sister, and it really tugs at the heartstrings. The 21-gun salute is the oldest cheese-ball trick in the book, but dang if it didn't get us just a little bit. We're not lawyers — nor have we ever served on a jury — so we have no idea if Olivia's bizarre courtroom tactics would actually stand up in a real case. But, we have to say it was pretty genius. Getting to gut your pervert husband for his affairs and soothe your conscience that you kept him out of the slammer? Win-win for a scorned wife. Okay, scratch that. 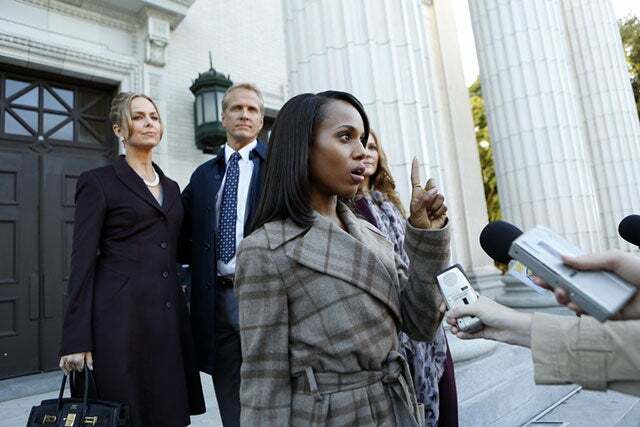 Scandal just got real Law & Order on us. We should have known that it's always the wife on these shows, but it wouldn't be the worst thing if they left the case twists to the actual crime shows. It's just a whole lot of drama for one hour. "It's not polite to sneak up on people." Huck's got a point here — Quinn sure knows how to push a button. We haven't quite figured out our opinion of her yet, but in the meantime it is funny to see her use all of Huck's tricks against him. "This isn't the Bush White House, we don't wear cowboy boots. We wear shoes, real shoes, thinking man's shoes." Burn, Scandal. Burn.